Voting begins for the upcycle challenge! Cast your vote with a "Like" on Facebook (watch for a post on April 18) or submit your vote in-person at a ReStore location. Submissions will be on display at the New Brighton store, and photos will be on display at the Minneapolis location. Help us celebrate our families partnering with us to purchase homes on the open market at our office! Winners announced for our ReStore upcycle challenge will be posted on the ReStoration Corner Blog and on our Facebook page. This is a day for Habitat supporters from across Minnesota to join together at the state Capitol to advocate for affordable housing. 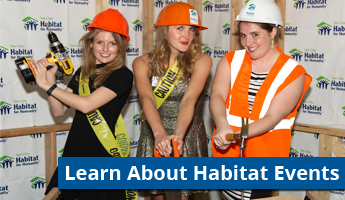 Participants receive training, hear from Habitat supporters and legislators, and then meet with their own legislators.